We will operate as usual on the next working day in line with current working patterns (our Leamington office is closed each Tuesday). Citizens Advice South Warwickshire (CASW) offers confidential advice online, over the phone, and in person, for free. We give people the knowledge and the confidence they need to find their way forward – whoever they are, and whatever their problem. However, a special need has arisen to help people with the fastest growing advice issue – Universal Credit (UC). As a local charity we need more volunteers so that we can improve the support available to people making a claim. 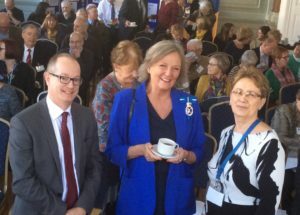 Citizens Advice South Warwickshire is set to deliver a new service called “Universal Support: Help to Claim” which offers end-to-end support to help people make a new Universal Credit claim and be ready for when their first payment arrives. We are looking to recruit several new volunteers with good IT skills to support others to make and complete their new Universal Credit claim, as well as a commitment to the aims and principles of the Citizens Advice Service. You’ll have the ability to interview people either in person or on the phone. Maybe you have had some experience of using the benefits system? Perhaps you are looking for a volunteering role before getting back to the workplace? Or maybe you have more time to give something back to your local community? Full training will be given for these posts and, after this, we would hope you could commit to one full day each week. The posts will be based at Leamington Spa and Stratford upon Avon. This is a great opportunity to make a real contribution by helping others in our community to resolve their problems – which is good for them and the wider community. CASW is a local charity helping local people. More than 100 people already give their time to helping run the service – we hope we can find more for this urgent need. Please contact us to find out more or get an application form. Support people in making an initial online claim for Universal Credit. Record details of claims on our case recording system. Refer people for additional support where appropriate. Prevent future problems by identifying failing policies and poor services. Computer literate, including able to enter data onto an electronic form. Able to use a telephone. Good at listening and being patient. Flexible and able to work well with other people. Interested in learning something new and passionate about making a difference. Willing to carry out role off-site on a rota basis. Basic understanding of Universal Credit and the online claim process. Knowledge of google drive and applications. Understanding of the welfare benefit system. Understanding of the wider issues faced by the local community. Please find our click here to find out our latest news _Citizens Advice December Newsletter 2018. 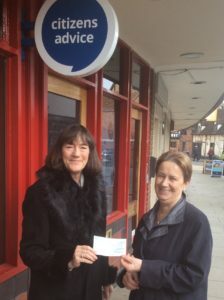 Kate Rolfe, member of the Rosebird Community Hall committee hands over a cheque for £400 to Yvonne Hunter, chair of Citizens Advice South Warwickshire. The donation comes from the income generated by the Rosebird Community Hall which is a not for profit enterprise. The committee donates funds back to selected good causes in the Stratford community. On Tuesday 13th November, Citizens Advice will hold its Annual General Meeting at The Court House, Jury Street, Warwick, CV34 4EW. The event will begin at 10:00 for tea and coffee, with the AGM starting at 10:30. We will finish the morning with a lunch. If you wish to attend, please sign up via this link. As a result, our Stratford Upon Avon office will be closed for the day but will reopen on Wednesday 14th November as usual. The September 2018 edition of our stakeholder newsletter contains articles on our services as well as an introduction from our new CEO.